As part of a home inspection, home buyers may choose to have a radon test admistered by the home inspector. Massachusetts home buyers should understand what radon gas is, how it is tested and what can be done to mitigate high levels of radon gas. 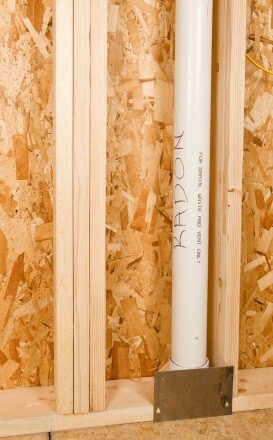 Radon is a naturally occurring radioactive gas that results from breakdown of radium and uranium in soil and rock. Because radon is a gas, it spreads out from the ground and into homes through foundation cracks and holes. It can move into any space that allows for air flow. Fieldstone foundations are more likely to have higher levels of radon, but cement is porous, so air can easily make its way through cinderblock and poured concrete foundations as well. Even new homes that are well-sealed and houses without basements can have elevated levels of radon. Radon can also be found in building materials, such as brick, stone or concrete. Once radon enters the home, it will accumulate and the radon levels will increase over time. Radon also continues to decay further into radon daughters, which are solids that cling to the surfaces of things like foundation sills, appliances and dust. When contaminated dust is inhaled, radon daughters can stick to the inside of the lungs, damaging lung tissue and thus increasing the risk of lung cancer. Radon is not just found in the air. For homes with private water, radon can dissolve into the well water, allowing the release of radon gas through running water. The radon in your water supply poses an inhalation risk and an ingestion risk; however, according to the U.S. Environmental Protection Agency (EPA), your risk of lung cancer from breathing radon in air is much larger than your risk of stomach cancer from swallowing water with radon in it. Homes with high levels of radon have been found in all Massachusetts counties. Most Massachusetts areas have moderate to high radon levels, with Middlesex, Essex and Worcester counties having the most incidences of high radon levels as determined by the EPA. The Massachusetts Department of Public Health's Radiation Control Program, in conjunction with the EPA, did a radon study in 1988. According to the research, one (1) out of every four (4) houses in Massachusetts may have elevated levels of radon that requires EPA-recommended action (see below). The EPA and Massachusetts Department of Public Health advise homeowners and home buyers to test for radon regardless of where they reside. According to the Surgeon General, “radon gas is the second-leading cause of lung cancer in the United States.” According to the Center of Disease Control, a person residing in the United States is 20% more likely to die from radon than from a drunken driving accident. Radon is odorless, colorless, tasteless, and otherwise undetectable by human senses; therefore, in order to know the presence and levels of radon, it must be tested for. Radon testing is often done by home inspectors, but it is recommended that all homeowners test for radon. There are many companies in Massachusetts that specialize in radon testing and mitigation. Do-it-yourself home testing kits for airborne radon are also available for as little as $10 for short-term testing (2 to 90 days) and as little as $50 for long-term testing (over 90 days). On its website, the EPA provides do-it-yourselfers with a checklist to ensure accurate testing procedures and readings. In addition, the EPA provides a comparison of short and long-term tests to help homeowners decide which radon testing kit is best. The EPA does strongly encourage long-term testing. When buying a house home inspectors typically will test for airborne radon with one of the following methods: (1) a testing kit that sits in the home for about 48 hours and is then sent out to a lab which produces a report with the average radon level during the time period; or (2) a machine that continuously monitors radon during a 48-hour time period and produces a report detailing the hourly fluctuation in radon levels. Radon levels can be greatly affected by weather, meteorological conditions, use of the property and activity inside the home. Radon in the water supply is tested by taking water samples and sending it to a lab for analysis. Neither Massachusetts nor the federal government regulate naturally occurring radon or radon daughters, but the EPA does offer specific suggested guidelines for homeowners and builders who seek to mitigate high radon levels. Concentrations of radon gas are measured as "picocuries per liter" (pCi/l). The EPA recommends that if a radon test results in a reading greater than 4 pCi/l, remedial measures should be taken to lower the average annual exposure to radon. If an elevated airborne radon level is found, there are two ways to mitigate it. First, a homeowner can lower the radon levels with caulking and sealing techniques directed at below-grade openings in the home’s foundation. Second, a homeowner can increase his home’s air exchange with various ventilation elements and permeable materials. This often involves retaining a specialized radon remediation company to install a ventilation system with an electronic fan that essentially draws air from under the ground and ventilates it outside above the house thus reducing the radon levels to below EPA recommended guidelines. For home buyers and homeowners who want more information about radon and/or about the cost of mitigation, which can vary from a few hundred to a few thousand dollars, assistance programs may be available. The Massachusetts Radiation Control Program’s Radon Unit provides information and financial assistance to homeowners that need radon testing and mitigation. Compared to airborne radon, radon in well water is typically much more expensive to mitigate. Radon in the water supply can be reduced in two ways: (1) point-of-use treatment devices that remove radon at a particular tap; and (2) a point-of-entry filtration system that removes the radon before entering the house. The first remediation system often costs a few hundred dollars whereas the whole-house water remediation system can cost $4,000-$6,000, on average.